We have been amazed at the bountiful crop from our pear tree this year. Yes, we can grow pears on the prairies. They are smaller in size but taste every bit as good if not better than the ones we buy in the store. Other than eating them fresh from the tree, I have been busy peeling, coring, and slicing pears and using them in different recipes. They are delicious and I don't want to waste any. I usually send muffins along with our son when he comes for a visit. This time I knew it had to be pear muffins. Cream together butter, sugar, eggs, and vanilla until fluffy. Whisk together dry ingredients and add to the creamed mixture alternately with the buttermilk just until mixed. Bake in a 400º oven for 20 to 25 minutes, when toothpick is inserted in center of muffin and it comes out clean. *Optional: you can sprinkle sugar and cinnamon on top of the muffins just before baking. Yield: 12 regular size muffins. They look like Cornice. And that recipe looks delicious. I also like to use pears in a chutney because they hold their shape a bit. Lovely to bite into a bit of pear with my pork chop. These sound so yummy! I recall my step mom making something like these....will have to get busy in the kitchen!! Betty, you come up with the best muffin recipes! I love pears and will be trying this one. We have one pear tree. When I bought it, I swear it said ornamental so I wasn't expecting fruit. First year it produced, I was scared to eat them!! Then last year got enough to eat and make yummy pear bread. Was hoping for the same this year but alas, I think the squirrels must have gotten to them first!!!! I just made a batch of these and they are perfect! 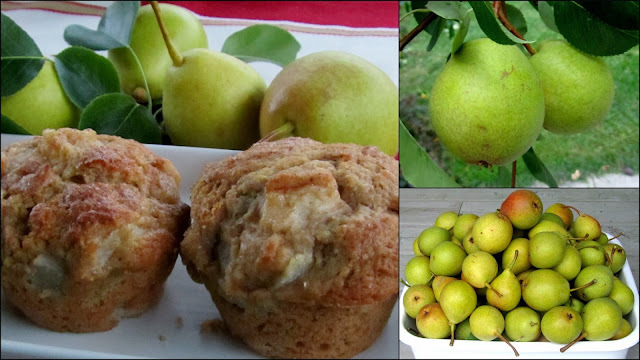 I thought my pears might be a bit over-ripe and cause the muffins to fall apart or be too wet, but the muffins turned out perfectly. Thanks for sharing this recipe! I made these last night and they were AWESOME! It's the "melt-in-your-mouth" kind of muffin, My husband had two in less than 5 minutes. I used margarine since it's what I had, but no other changes in the recipe. Thank you!